Retelling is the process in which a child reads or listens to a story and then summarizes it in his own words including the beginning, middle and ending. Retelling helps students develop a sense of story structure and become more accurate in monitoring their own understanding. Students can transfer this knowledge of story structure to their own writing. Practicing retelling also strengthens students’ speaking and listening skills and addresses many Common Core State Standards. However, retelling can be very difficult to teach; students often struggle to include all of the components required for a detailed retell. Sharon the Summarizing Squirrel’s Tell the Tale tool helps students learn to retell in an engaging, kinesthetic way. The Tell the Tale strip has 8 boxes with both visual and textual prompts to assist students with retell. They move their fingers along the strip or jump each box (in the enlarged vinyl version) as they retell. 2. Laminate and cut out. 3. Determine which Tell the Tale retell strip works best for your students’ instructional needs. The first Tell the Tale strip includes a Central Message or Author’s Purpose box; this is an ideal tool when reading fables and folktales or when teaching author’s purpose. It is best to use with students who already have experience with retell and are fairly proficient with the skill. 4. The second Tell the Tale strip has 5 retell boxes with transitional words to prompt students to tell 5 important events. This strip is best for students who are learning how to give a detailed retell or for students who need additional practice and support. Use these differentiated strips to scaffold instruction as needed. 5. Enlarge the Tell the Tale strip on vinyl at your local Office Max or other print shop and use like a hopscotch. This is my students’ favorite way to retell! 1. Model retelling the story using selected Tell the Tale. Start with the first box, moving your hand along to each box as you share the retell. Here’s an example from Frog and Toad’s The Letter. a. “In The Letter, Frog and Toad are sitting on Toad’s porch one day. b. First, Toad is very sad because he hasn’t received a letter. c. Next, Frog goes home and writes him a letter. d. After that, Frog goes to Toad’s house to wait for the letter, but Frog ends up telling Toad about the letter. 2. During guided reading groups, have students read selected text, stopping to identify and discuss key literary elements. After reading, partner students and have them retell the story using Tell the Tale. They can either take turns sharing the key details, or one partner can complete the retell while the other listens and then switch turns. 4. Use the Retell Rubric to assess students progress and determine next instructional steps. 5. 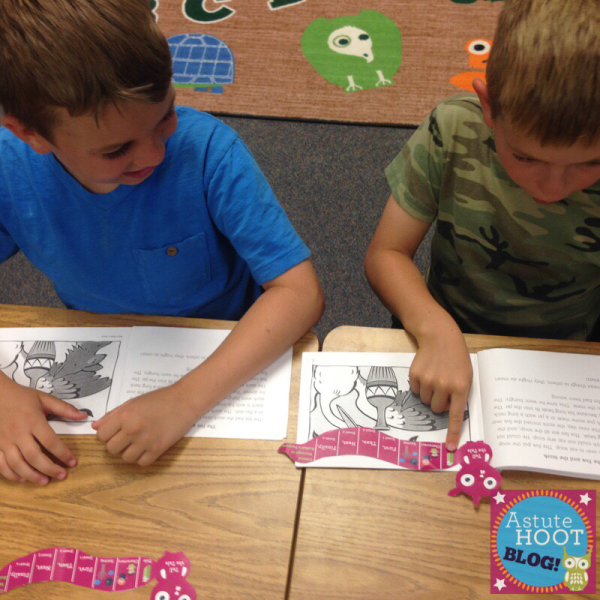 Tell the Tale retell strips can also be used during center time (with a parent volunteer) and also a homework tool. Be sure to include directions and expectations for parents and volunteers. 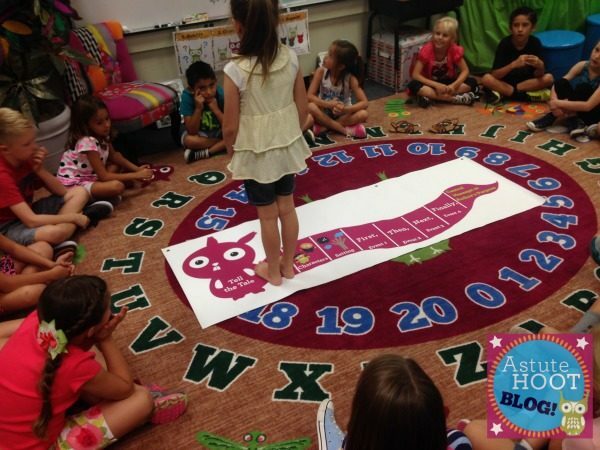 Looking for additional retell and summarizing activities? 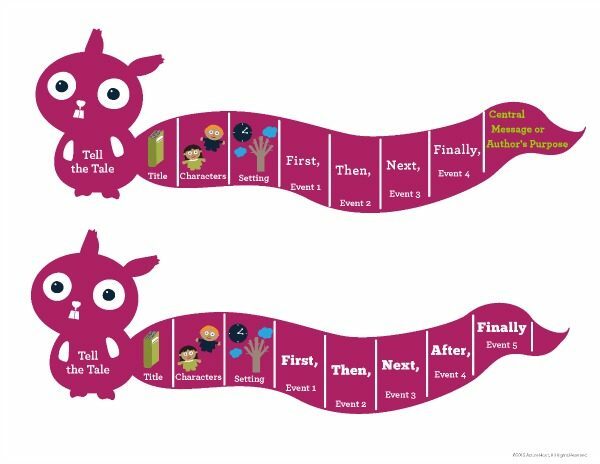 Download Sharon the Summarizing Squirrel’s complete retell unit here.